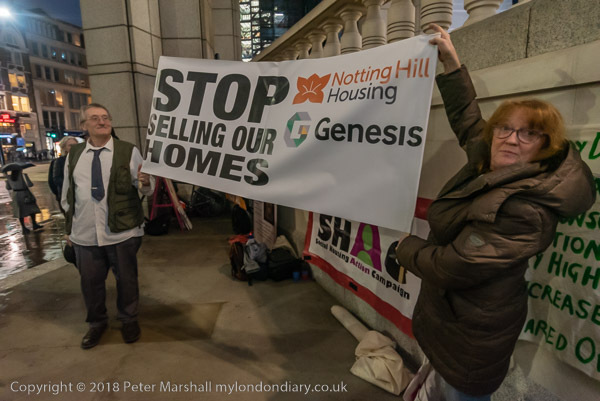 I wasn’t sure, as I made my way to SHAC’s Alternative Housing Awards 2018, due to take place outside the annual National Housing Awards on the edge of the Broadgate development whether it would be possible for the Social Housing Action Campaign to stage the protest there, or if I would be able to photograph it. Broadgate is one of the increasing number of areas in London which, although open to the public, are privately owned, and where photography and many other activities are strictly controlled. Over the years I’ve been stopped from photographing a number of times, sometimes politely, other times less so. It’s often affected me less than many other photographers, partly because I almost never use a tripod and partly because I generally work fairly rapidly – and have often made the picture I want before security notice. But although the security had insisted the protesters move down a little away from where they had wanted to stage their protest, they did allow it to happen, only insisting that the protesters remove banners they had taped to the walls, fearing they might cause damage. There was considerable argument over this, but eventually as security told them they would call the police unless they took the banners down, they were removed and held instead. I’m pleased to say security completely ignored me, though the head of security did request a videographer not to film him talking with the protesters, and I was able to cover the event unhindered. I was very pleased the protest had not been forced onto the pavement outside, both because it was considerably darker, but also because it was raining rather steadily and we would have got very cold and wet. 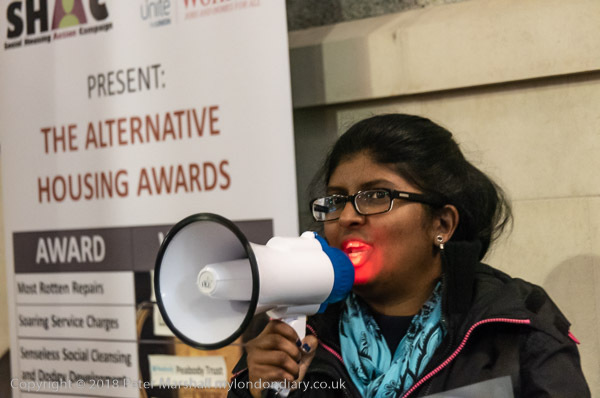 The Alternative Awards Ceremony wasn’t the most interesting event for a still photographer, though I think it will have made a better video. After an introduction for each award to a housing association made by someone from Unite Housing Branch who had organised the event together with SHAC, there was an invitation for them to come up and accept a small cup, but not surprisingly none of them had turned up to collect their awards. Instead residents or former residents or workers came to take them and spoke about their own experiences. Although we still think of housing associations as being organisations set up to provide low cost social housing, having taken over much of the role of local councils, along with many of their council estates as a part of Thatcher’s policy of marginalising local government, they have changed over the years to become in many cases virtually indistinguishable from private developers and landlords, producing new developments often largely for sale or rent at market prices, usually with fewer properties at high cost affordable rents or shared ownership schemes, and virtually none at true social rents. 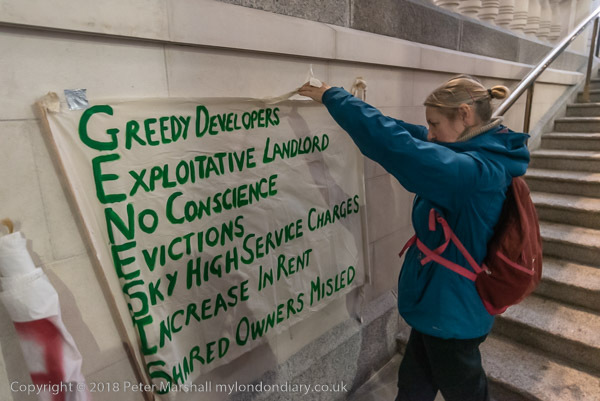 Tower Hamlets Community Housing for Blundering Board and Management. 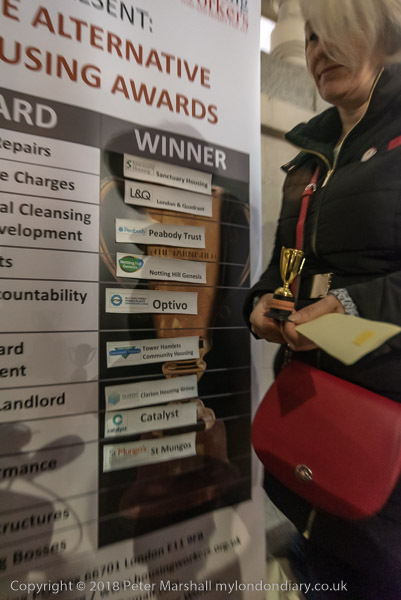 Clarion Housing Group was awarded as Overall Lousy Landlord. Peabody Trust for its Relentless Restructures. Catalyst was awarded as Overall Bullying Bosses. 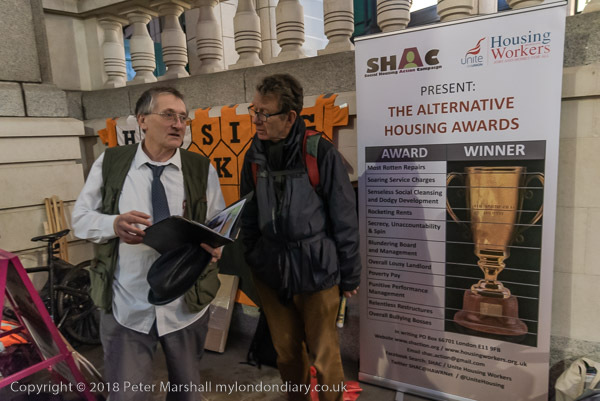 More at SHAC Alternative Housing Awards 2018. This entry was posted on Friday, February 8th, 2019 at 09:41 am and is filed under My Own Work, Photo Issues, Political Issues. You can follow any responses to this entry through the RSS 2.0 feed. You can leave a response, or trackback from your own site.